I have a Raspberry Pi project that I’d love to use street maps for, but it would be a daunting challenge for me to figure out how to read map data and write the code to draw the maps on screen. It’s why I was delighted to discover Tangram ES, which is a library for rendering 2D and 3D maps using OpenGL ES 2 with data from OpenStreetMap. The library works on a number of devices, including of course Raspberry Pi. Patricio Gonzalez Vivo (from the video above) and the team at Mapzen are responsible for the open source project, which is an offshoot of their WebGL map rendering library, Tangram. While Tangram ES is still a work-in-progress, they’ve been using Raspberry Pi 2 to speed up their development of the library and they’re ready for more people to take it for a spin. Structured a lot like a research and development lab, Mapzen is a startup founded with the idea that mapping done collaboratively, transparently, and in the open can produce more resilient software, and ultimately, better maps. Their focus is on open source tools and using open data to create the building blocks for future mapping applications, including search & geocoding, routing, and transit, in addition to the rendering work they’re doing with Tangram. Patricio is a graphics engineer on Tangram, responsible for implementing different graphical features such as tessellation, lights, materials, environmental maps, and other CG effects. The team also includes Brett Camper, who is Mapzen’s co-founder, as well as Peter Richardson, Ivan Willing, and Karim Naaji. 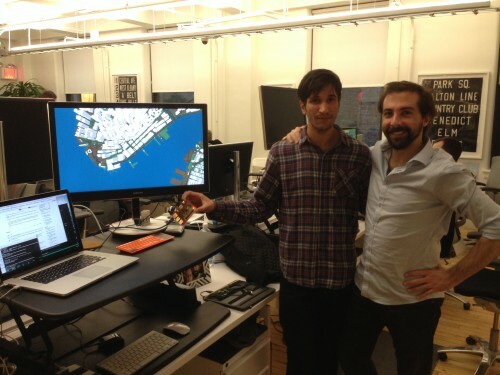 The ES version of Tangram was started by Matt Blair and Varun Talwar. Does OpenGL ES allow bigger-than-the-screen buffers to allow a similar approach to be used here? wow .. super nice guy .. super smart project! Here’s the thing: The Ordnance Survey in the UK have made their mapping available as OS OpenData for Minecraft. One example they show is “A ramble through Snowdonia in GB Minecraft 2”. Is it possible to use that data with Tangram on an RPi2 combined with a GPS to be used whilst out and about?. That would be a fine example of Art mimicking real life. I especially love an electronic map. Excellent project, a wonderful idea and a magnificent execution. Any news about the Christmas Competition 2014? On a B2, builds quick and easy with make -j6. Doesn’t need X-windows, runs straight from command line. add -m to command line to use mouse. Convinced me the GLES has a future. Now to add Lat. and Long. to command line to start somewhere more meaningful to me than Manhattan. Hi Roger, can you post an issue on the github repo of tangram-es? I will personally work on the lat lon args + GPS hat integration soon. That, I a noob to raspberry and linux was able to get it to work at all without bricking my sd card (again) is wonderous. The mouse drag works well but the roller wheel does not zoom. I was caught unawares that there were no menus visible. This might have been an overscan issue with my 42″ panasonic plasma tv (BSD OS! could this be rooted and fixed?) of 50 PX Left&Right and 35 px up and down, (in the best case after adjusting the tv ‘format’ to ‘full’) but given the comments I thought I’d give it a mention. 1:Let folk know that the ALT TAB will not work to exit to something else. 2:Give the commant set prior to instructions to do the build and start Tangram. 3: change the above behaviours and make sure that the program has some easy way to limit the screen usage to the non overscanned portion. Keep in mind that Tangram is a library for developers to use in their projects. The program that you launched is just the compiled sample code which demonstrates the library’s basic features. I wouldn’t expect advanced functionality out of it. It would be great to see OpenSeaMap in this way! this is what happens to it if it helps seeing how to fix this.